This vertical garden has given me so much pleasure over the summer months and it took all of 15 minutes to put together. It requires a pallet in good condition, some woven plastic membrane and a staple gun. After that, just add soil and plants. This pallet was donated to the allotment site by the builders next door. And it’s an ideal shape and size: 1) it will stand up on its own, 2) the horizontal struts at the base make good plant containers with minimal reconstruction, 3) it’s aesthetically pleasing: rustic without looking too decrepit. 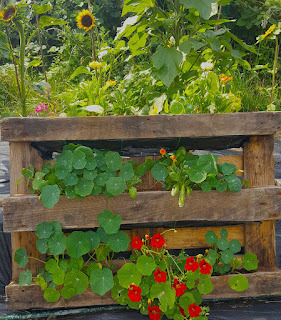 If you are going to re-purpose pallets, it really does pay to be very fussy. After all, they’re free. I cut some strips of membrane to fit, and stapled pieces to the underside of each strut, as shown. This made the planting pockets. Next, I filled the pockets with multi-purpose compost and found a good place to site it. Finally I planted up the seedlings and watered them in. Without irrigation, it’s important to put the plants that are most drought resistant at the top and those that need most water at the bottom: plants on the top tier of a vertical garden are very exposed and will lose water very quickly. At the bottom, however, all the water gathers and the plants here are also often in a certain amount of shade. I had calendula, cornflowers and eschscholzia Jelly Beans in the top two rows, and nasturtiums along the bottom as well as tumbling over the upper tiers. This kind of shallow-pocketed, non-irrigated vertical garden works best for a single season. After that you can decide whether to redo the planting for another year or to re-purpose the pallet again. As I said, they’re free.